Former Vice President Joe Biden has yet to announce whether he will run for president in 2020, but there may be an opening in the field for a candidate with cross-party appeal. After a flurry of people jumping into the presidential race, this past week a rare thing happened: A bunch of people jumped out. But their decision to pass on the race could be an indication that an even bigger candidate is close to launching a campaign: former Vice President Joe Biden. Biden has made no secret that he's serious about a run at the White House, after bowing out four years ago following the death of his son. Questions remain about how much the former Delaware senator, who would be almost 78 on Election Day, could appeal to a changing Democratic Party that's awash in a desire for a younger, progressive candidate to energize its base. But the potential candidates who passed this week would have offered voters some of the same attributes as Biden, and their decisions to sit out in 2020 may signal a clearing of the field for the elder statesman. 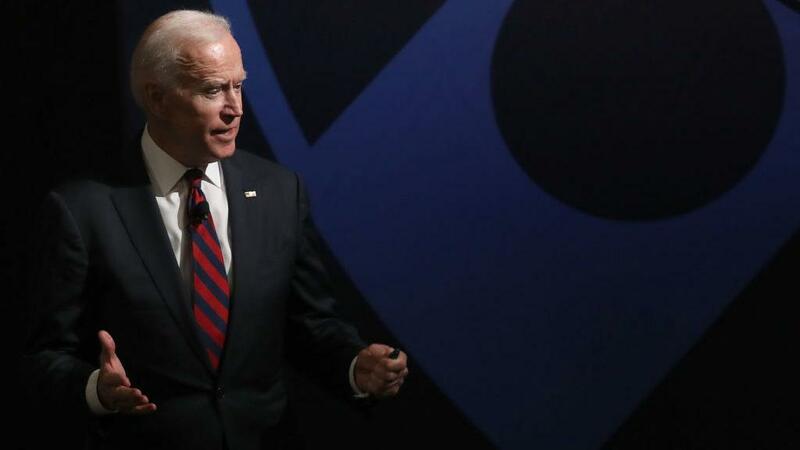 The New York Times, citing officials familiar with the discussions, reported on Thursday that Biden's chief strategist has recently called several potential candidates to tell them Biden is "95 percent committed to running." Around the time that story ran, a trickle of "no's" began. Former New York City Mayor Michael Bloomberg, a former Republican and independent, announced he wouldn't run on Tuesday. Bloomberg is more of a centrist who has been known to reach across the aisle — as Biden often did during his decades in the Senate, in addition to retaining close friendships with Republicans. The Times also reported that Bloomberg's advisers saw Biden as major hurdle, with many focus groups fawning over Biden's "Uncle Joe" persona. Former Attorney General Eric Holder is another member of the Obama administration who was testing the waters but ultimately decided against jumping in this week. Like Holder, Biden has made voting rights a priority in his post-administration days. Perhaps Biden's biggest potential ideological rival was Ohio Sen. Sherrod Brown, who conducted a "dignity of work" tour through several early states before announcing on Thursday that he would not run. Brown would have appealed to the same white working-class, populist base as Biden — voters who proved to be Hillary Clinton's Achilles heel in 2016. As a proud native of Scranton, Pa., Biden has an edge in the very states that President Trump captured to win the presidency — Ohio, Pennsylvania, Michigan and Wisconsin. Steve Schale, a Florida Democratic strategist who was part of the "Draft Biden" initiative in 2016, acknowledged the potential crossover between Biden and Brown, but he argued that the former vice president's appeal to that group stretches even further. "I think there are probably elements of Brown's coalition that would look to a Biden-type candidate. But I think as we've seen in early polling, it's not like Joe Biden only pulls from one lane of the Democratic Party," Schale said. "He does well with Middle America, working-class voters, with African-Americans and Hispanics, and you don't see a huge gender gap with his vote." Republicans will even privately — and sometimes publicly — acknowledge that Biden worries them with a cross-party appeal that someone like Bloomberg also might have offered. The growing primary field isn't devoid of that centrist position, however; former Colorado Gov. John Hickenlooper made a middle-of-the-road pitch as he launched his campaign. Still, Biden is by far the most imposing figure sitting on the sidelines, and this week's notable withdrawals leave him as one of the biggest lingering variables as the 2020 field takes shape. While Biden has been the front-runner in early polls, those often aren't good predictors of final results. Longtime Democratic pollster Peter Hart is skeptical of early surveys that show Biden with a lead, given the type of change the party base seems hungriest for. The gaffe-prone politician will also face questions about his background on civil rights, criminal justice issues and more. "If he thinks of himself as the Colossus of Rhodes and everyone sort of has to maneuver around him or through him, I think he will get off to the wrong start," Hart cautioned. Even a politician who spent over four decades in Washington can still draw voters, though. Hart, who frequently conducts focus groups across the country, said it will depend on the type of campaign Biden sets out to run. "It's not that Joe Biden can't reach across the entire Democratic spectrum, because he can. He's liked and respected by all elements within the Democratic Party. I think it is about his agenda and his outlook," Hart said. "If his outlook is the head that's turning behind or back, versus the forward-looking outlook, I think he's going to have a hard time. Because this is about tomorrow — it's not going to be about yesterday." Someone like former Texas Rep. Beto O'Rourke, who's also still weighing a campaign, could challenge Biden there. The 2018 Senate candidate who came closer than expected to knocking off GOP Sen. Ted Cruz could offer a blend of that same populism but mixed with a younger progressivism. Likewise, Minnesota Sen. Amy Klobuchar has a proven Rust Belt appeal, while also bringing gender diversity to the field. But Schale, who says he will support Biden if he gets in, points out that it's Biden whom the party often looked to during the midterms and other tough elections as one of its most valuable surrogates. "He was the one Democrat that was asked to go to all corners of our country and all corners of our coalition, and I think that speaks to the brand he brings to the race," the Florida Democratic strategist said. Mo Elleithee, a former Democratic National Committee spokesman who worked on Hillary Clinton's 2008 campaign, said he thinks it's likely that both Bloomberg and Brown had other reasons for not running beyond just Biden. But, Elleithee said, Biden still casts a wide shadow on a race he has not even entered yet. "There's an authenticity about him, that he is who he is and everyone knows that," said Elleithee, who now directs Georgetown University's Institute of Politics and Public Service. "When he speaks, particularly about helping the middle class, he does it in a very populist way that I think a lot of people can connect with, and that's nothing to sneeze at in this day and age." And while there is a clamoring for progressive candidates — such as Massachusetts Sen. Elizabeth Warren, Vermont Sen. Bernie Sanders or California Sen. Kamala Harris — Elleithee argued that if Biden does get in, he may ultimately have more grassroots appeal and can make the case that he can best go toe-to-toe with Trump. "Outside of the Beltway, people aren't talking about moderate vs. progressive. What they're talking about is, 'Who gets me and understands that I'm feeling the squeeze and I'm feeling left behind?' " Elleithee said. "And I think Biden gets that, and he can speak to that in a very authentic way."